All in a 7-Step Mini-Course. Research by The New Scientist Magazine (1992) has shown hypnotherapy to be the safest and quickest way to quit smoking. People were six times more likely to quit with one session of hypnosis and remain non-smokers over 12 months after their session, compared to those who used Nicotine Replacement Therapy, such as patches or gum. So, YES hypnosis works incredibly well! Hypnosis is a proven, reliable method for natural smoking cessation and is one of the fastest growing fields in healthcare. 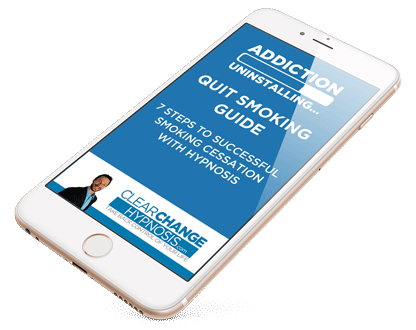 Become one of thousands of people across the country to quit smoking using 1-on-1 hypnosis. For personalized, 1-on-1 hypnosis sessions as part of the "Quit Smoking For Life" program, call 717-601-2211 today. Whether you've been smoking only a short while, or for many years, hypnosis can help you rapidly remove the habit and urges to smoke. Nicotine Replacement Therapies like the gum or patch focus on the nicotine, but don't address the real underlying reason you smoke - the smoking habit. Each time you reach for a cigarette, you do so because of the smoking habit. Your urge to smoke is "triggered" by your smoking triggers. It may be that you smoke when you wake up, or with your morning coffee, or on your way to work, or after meals, or as a reward for completing a task, when you're feeling stressed... These are common smoking triggers, and the list goes on! It's because of your smoking triggers that the activity of smoking still happens, despite your conscious desire to quit smoking . Hypnosis works by making changes at the subconscious level where all behaviors occur. When the change is made, you'll no longer wonder "Will I, or won't I have a cigarette?" The battle in your head will be gone. During your first session, we completely reprogram all of your smoking triggers, so you no longer feel the urge to smoke in your daily activities. Most people will either STOP smoking completely or cut back dramatically following the first session. Subsequent sessions are designed to build upon the first and are even more powerful to keep you on track to quit smoking permanently. 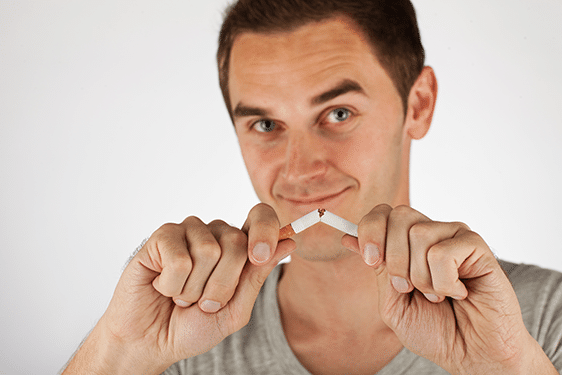 Whether you've been smoking for months or many years, hypnosis can help you rapidly remove the habit and urges to smoke without the typical withdrawal symptoms. Hypnosis can even help you quit smoking without gaining weight. By following our program where we replace situational smoking with positive behaviors, you may even lose weight. If you smoke about a pack a day, spending 5 minutes per cigarette, that's over 90 minutes each day spent smoking. You need to plan for that time. If you don't, you will tend to gain weight by snacking or mindless eating. That's why we account for those recovered minutes by training your subconscious to do more of what you want and less of what you don't. Few to no cravings or withdrawal symptoms. Little to no weight gain, sometimes even weight loss since our program helps you replace smoking with behaviors healthier than eating. Strong willpower, even around other people who smoke. Increased awareness, less mindless habitual activity. Learning new ways to handle stress and boredom naturally. Preventing relapse into smoking in the future. Much safer and more cost effective than drugs. 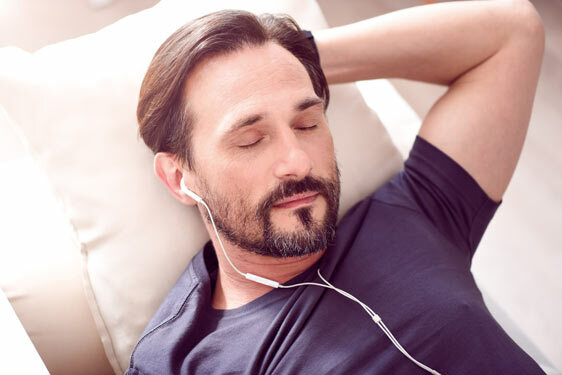 In addition to avoiding the awful withdrawal feelings of smoking cessation, hypnosis actually leaves the former smoker feeling refreshed, relaxed, and energized. Stay on track with handouts and worksheets. Manage stress and cravings with mental tools and techniques. 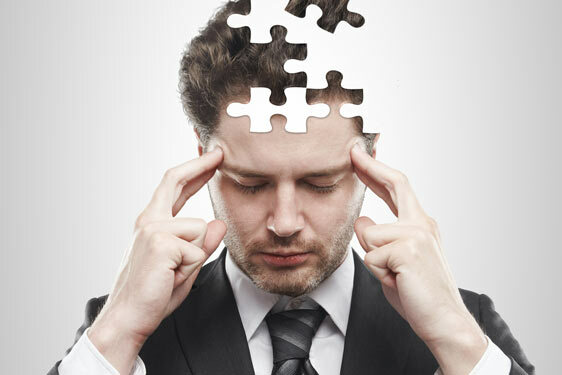 Train your mind to stop cravings, ease negative emotions, and better handle stress. Break the triggers that created the urge to smoke. Bust the cravings to smoke quickly. Increase self-confidence to remain a non-smoker. Positively change your relationship with cigarettes. Our "Stay With You" Guarantee. After completing the quit smoking hypnosis program, if at any time in the future you find the need to come back to quit smoking, future quit smoking sessions will be free of charge, up to once per month, as long as our doors are open for business. Very few clients ever need these sessions, though they are available to provide you with complete support to help you quit smoking. We also provide help with chewing tobacco and addiction to vaporizers and nicotine supplements. Enter your name and email address above to learn how to stop cravings instantly with the Craving Crusher Technique. "I get people to easily quit smoking without willpower, withdrawal, or weight gain." Get honest answers from a leading certified hypnotist. There's absolutely no pressure, and no hard sales techniques. Just simple questions and honest answers. You have nothing to lose but the habit. Enter your email to get your FREE "Kick the Habit"